Tiger Woods won the Farmers Insurance Open and the odds came tumbling down on his chances to win the upcoming Masters Tournament in April. 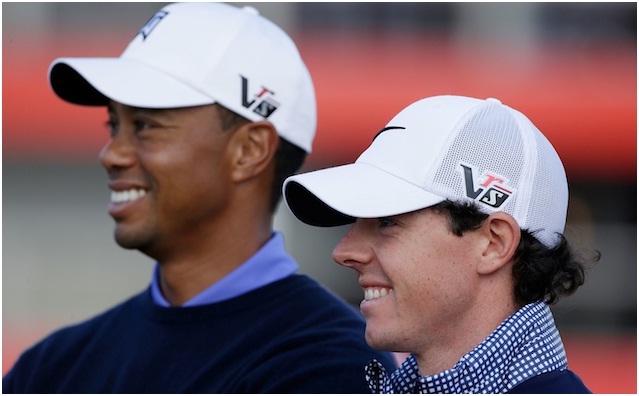 Tigers new found friend and nemesis, Rory McIlroy led the field at 5 to 1 while Tiger was somewhat behind him at 13 to 2. Well, since the Farmers tourney, those odds have essentially reversed themselves leaving Tiger on top, for now. Tiger takes over the 5-1 spot and McIlroy moves back to 11-2 with Phil Mickelson third at 14-1. It had been a 749 day dry spell for Woods before he won the World Challenge in 2011. He looks like he aged 15 years in those 749 days. Each time he won in 2012….at Bay Hill, Memorial & the AT&T National, he was asked the same question. Is the Tiger back? His answer is always the same, “I never left”. Well, there may be differing opinions on that score but it sure is nice to have Tiger Woods back at the front of the pack again. I like watching him play. But Tiger is a tough competitor and he is tough on himself as well. The man has a drive to be admired and Woods will really “be back” when no one else is in front of him. For over 5 years Tiger Woods was the undisputed Number One Golfer in the World, but now he is not. Last year a young man from Ireland named Rory McIlroy managed to slip by Tiger too many times and ended up winning just about every major award they gave out in 2012 including the PGA Championship. In August of 2007, California Governor Arnold Schwarzenegger and First Lady Maria Shriver announced that Woods would be inducted into the California Hall of Fame. He has been the AP Male Athlete of the year four times and in 2009 was named the AP Athlete of the Decade. Woods showed obvious irritation during the final four holes because of the very slow going on the golf course. The round seemed to last for hours and even CBS TV had to run overtime to show the finale. Everyone, including Tiger, was a little irritated by the end of the match, but his victory was never in doubt. It was Tigers 75th win on the PGA tour. Just 7 short of the record held by the late, great Slammin’ Sam Snead.